Your first 5 pages can make or break your book. In this three-week class, agent and author Lauren Spieller will show you how to inject voice into your opening, and the tricks to writing a great query. We all know not to judge a book by its cover…but what about its first page? You only get one shot at hooking an agent, so why not go directly to the source and find out what they're looking for? 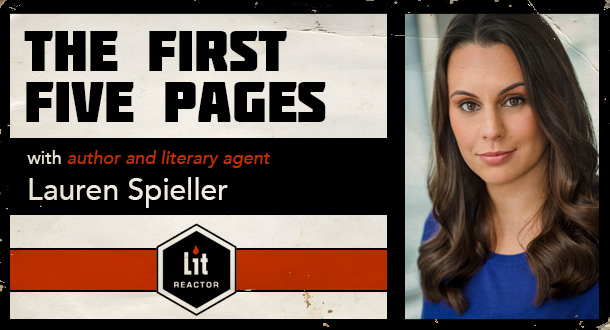 Introducing Lauren Spieller, author of the critically-acclaimed Your Destination Is on the Left, and a literary agent at TriadaUS. In this three week online workshop, Lauren will teach you the fundamentals of writing a fantastic first page—followed by four equally fabulous pages—as well as why Voice is queen, and how to write a killer query letter. All skill levels, age categories, and genres are welcome. Week 1: Nailing the First Page. Week one will focus on what a first page needs to accomplish (the “before” moment, which establishes character, setting/world, current conflict, possible stakes). Lauren will also do an inline critique of your first page, and provide big picture thoughts on how you should revise. Week 2: Voice – What is it good for? Absolutely everything. Week two will focus on creating a unique voice/point of view, and how doing so will elevate your first page. Lauren will provide feedback on your first five pages, as well as a one-page study of who your main character is and what you are establishing about them and your world in the first five pages. Week three is all about querying. Lauren will explain what querying is, and will provide a step by step breakdown not only of the query letter, but of how to summarize your novel in two neat little paragraphs with a focus on framing the story in a way that will appeal to agents and editors. She will also provide inline feedback on your query letter.